I’ve been trying to get a decent photo of the Wellington Monument in the park for quite some time now, I tend to give up for months and then head back down and start off all over again. I have never been a great lover of photographing such huge upright monuments [or buildings for that matter], there just tends to be so many problems with trying to achieve decent results. I tend to give in and head off to meet some familiar trees instead. Speaking of familiar trees, I am truly gutted to discover that I missed an exhibition by Thomas Pakenham in The Molesworth Gallery, in whose wisdom was it to have such an amazing collection on for only two measly weeks. If you are not familiar with this man then I suggest you run out and get yourself a hold of a book called “Meetings With Remarkable Trees”, and that’s just for starters. I guarantee you that you will end up buying all of his photographic books, especially if you are tree fanatic like me. Anyway, back to my main subject here today. I was going through some old infra-red photos from about three years ago and found this here little beauty, obviously that’s my personal opinion, you can be the real judge of that. The photo doesn’t feature the entire monument but I really like the fact that it appears to be attempting to hide behind the trees, I wonder is it aware that we can all see it. Not the greatest game of hide and seek I have ever witnessed. I also get the impression that the trees on the left of the picture seem to be looking towards the monument with a “We can see you, stupid” look on their faces. Ok, so the trees don’t have faces and the monument can’t actually play hide and seek, they do when you have the imagination of a two year old running around the house. This one’s for wee Paddy who has opened up my imagination all over again. 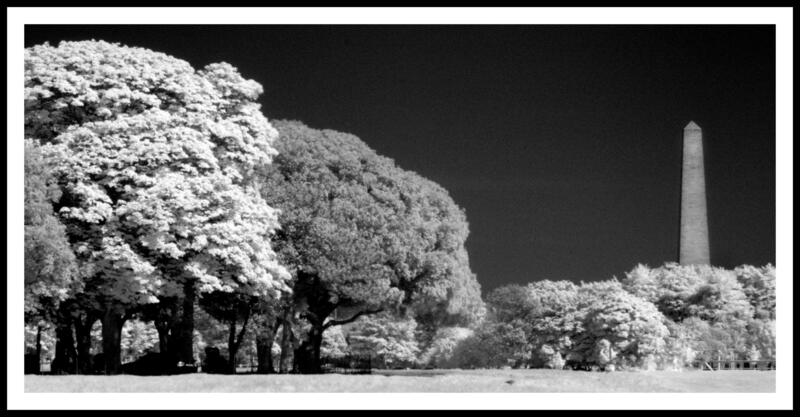 This entry was posted in Black and White Photography, Infra-red Photography, Irish Landscapes, Phoenix Park and tagged Black and White, Infra-red Photography, Phoenix Park, Photography. Bookmark the permalink.